The Norwegian Escape has arrived at its new home in Miami, Florida where the large ship will sail the Caribbean every week. NCL’s largest ever cruise ship and one of the largest in the world arrived At PortMiami under darkness in the early hours of Sunday morning on November 8. The ship is preparing for its christening ceremony which will be held today in Miami, Florida. International superstar Pitbull who is also known as Armando Christian Perez will be the ship’s Godfather. Pitbull will put out a musical performance along with a ton of festivities to launch the ship into service. You can watch below as the ship arrived at Miami in the early hours of Sunday morning. After a special 3-day cruise to the Bahamas the first Breakaway Plus class ship will begin normal cruises from November 14. Norwegian Escape will sail 7-day eastern caribbean voyages calling at St. Thomas, U.S. Virgin Islands; Tortola, British Virgin Islands; and Nassau, Bahamas. 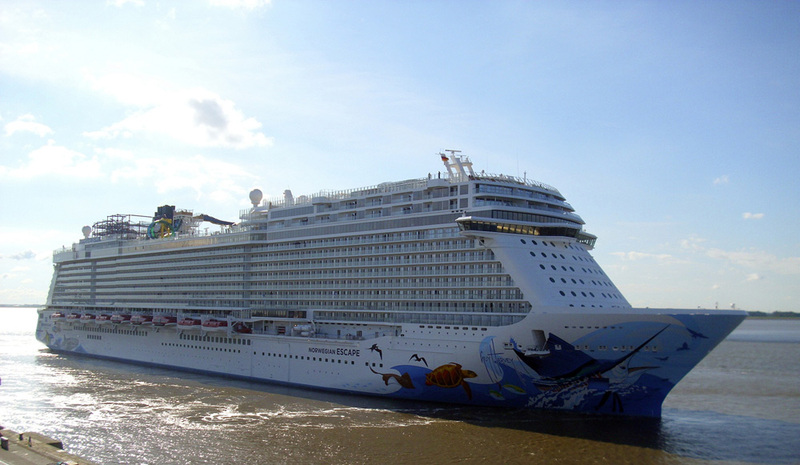 Norwegian Escape is 164,600 gross tons and can carry 4,248 passengers at double occupancy. The ship has some industry first features including the first ever Snow Room and Margaritaville at Sea.